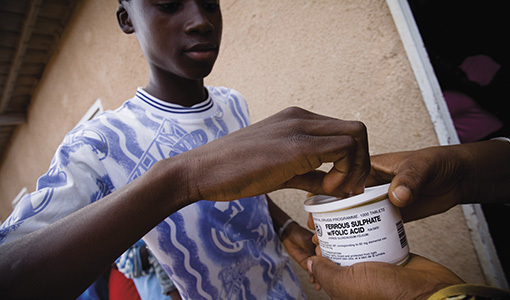 The hunt for a safer supplement for developing countries and older adults. Treating iron deficiency—the most common nutritional deficiency in the world—is a double-edged sword. Iron supplements help, but in a paradox that has stymied health efforts for decades, they can also make existing infections worse. This is a great concern for developing countries, where both iron deficiency and dangerous bacteria and parasites, such as those that cause malaria, are prevalent. Now researchers at Tufts, with support from the Bill & Melinda Gates Foundation, are trying to identify safer forms of iron to use, particularly in malaria- endemic countries. Iron deficiency affects some 40 percent of women and children worldwide. It often causes anemia, which can impede development in young children, impair immune function in adults, and increase the risk of death in pregnant women and their babies. To combat the deficiency when iron-rich foods are not available, supplements must be given in relatively high doses, because most forms of iron are not well absorbed. That unabsorbed iron can cause side effects worse than the condition it’s meant to treat: upset stomach, diarrhea, inflammation, and worsening of harmful bacterial infections. These potentially life-threatening consequences have limited efforts to address iron deficiency in developing countries. In January, Tufts researchers began a human clinical study to test new forms of iron for safety and effectiveness. The team is led by Simin Meydani—director of the Nutritional Immunology Laboratory at the Jean Mayer Human Nutrition Research Center on Aging (HNRCA) and vice provost for research at Tufts—and Gerald Combs Jr., adjunct senior scientist at the HNRCA. It includes other researchers at the HNRCA, Tufts Medical Center, Boston Children’s Hospital, Iowa State University, and the University of Cambridge. Together, they bring insights from several fields: nutrition, immunology, microbiology, gastroenterology, and molecular biology. “This was a unique opportunity to bring all these talented and committed experts from within Tufts and our collaborating institutions together to have a holistic approach to addressing a complex problem,” Meydani said. Over the next two to three years, the researchers will test two new types of iron supplements with older adults to see whether they have fewer side effects than iron sulfate, the form commonly used in oral supplements today. Because many older adults take iron supplements but often find them irritating, this research could be particularly useful for that age group. The researchers will also examine the role iron plays in intestinal health and immune function, and how supplements work at different doses and when taken with a multivitamin. “We believe this will be a pivotal study in allowing progress in safe iron supplementation in areas of need,” Combs said.